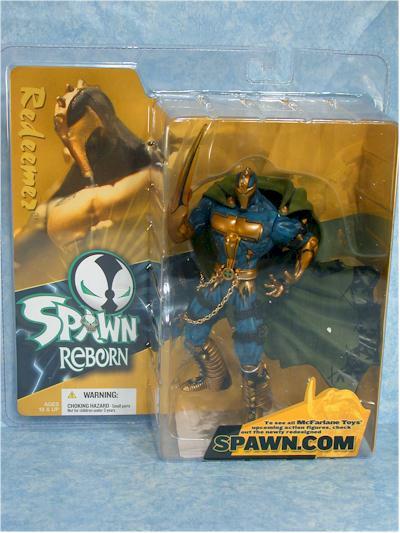 Mcfarlane Toys slipped in an extra set of Spawn figures this year, called Spawn Reborn. These six figures are predominately repaints of six earlier figures - Redeemer from the third series, Curse of the Spawn from the lucky 13th series, Domina and Clown (reviewed ealier) from the 20th series, and Raven Spawn and Wings of Redemption Spawn, both from the 21st series. Considering this series is just after the 22nd (it's not considered the 23rd, as it's 'special'), it really is just a re-deco of four figures from the last two series with a couple others thrown in for fun. Re-decos are slightly different than repaints. Repaints are exactly that -- simply a change in paint colors. But re-decos contain slight sculpting changes as well. Unfortunately, McToys is getting a little loose with the term here. The only re-decos in the set are the WOR Spawn (new wings) and the Redeemer Spawn (a different backpack). The other four are simply repaints, with a cloth cape thrown in with Curse of the Spawn for giggles. Tonight's review covers the Redeemer, Domina and Wings of Damnation (he was switched from Redemption to Damnation - WOD) Spawn. I reviewed the Clown awhile back at Movie Poop Shoot, and I'll be reviewing the Raven Spawn and the Curse of the Spawn figures there as well. You should be able to find these at Gamestop and Babbages stores right now. The specialty shops are charging the ridiculous sum of $12, but more main stream retailers should be around $10. Have I mentioned I like the clamshells? I'm glad we'll see something similar with the Palisade's Muppets line starting with the next series. Too bad the text on the colorful insert is so skimpy. 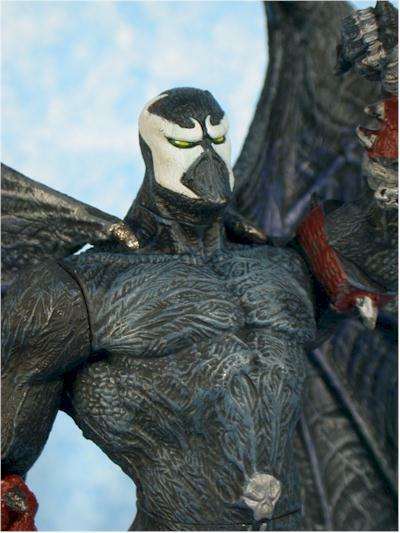 It's important to point out that only WOD has any new sculpting, with his wings. Redeemer has a smaller backpack, but that's not really part of the sculpt. 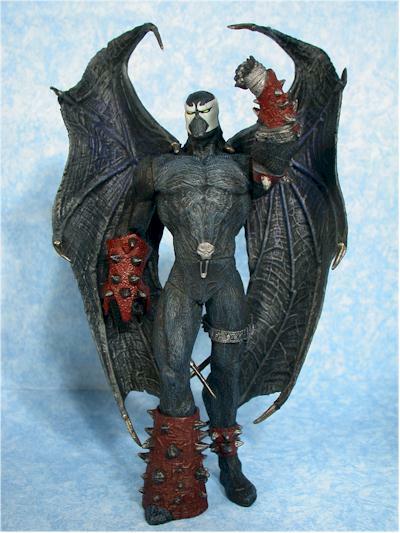 The Redeemer sculpt looks fine, but suffers from being an older Spawn figure, with less detail than more recent releases. WOD gets extra points because it's a repaint of a figure that was already one of the better ones, with some very nifty new wings. The sculpt is great, with plenty of detail and a great design. 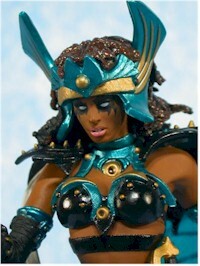 Domina's sculpting detail is good, although she's my least favorite of the warrior angels. Her big problem is the awful pose that's been selected, which is supposed to imply motion, but simply looks painful. It also makes it extremely hard to get her to stand on her own. In general, the paint application is clean and neat. There are little to know issues with the lines, over spray, bleed or inconsistency. WOD stands out due to the excellent use of a wash to bring out the sculpting details. I wish there was a little more color somewhere on him, but that's a very minor complaint. 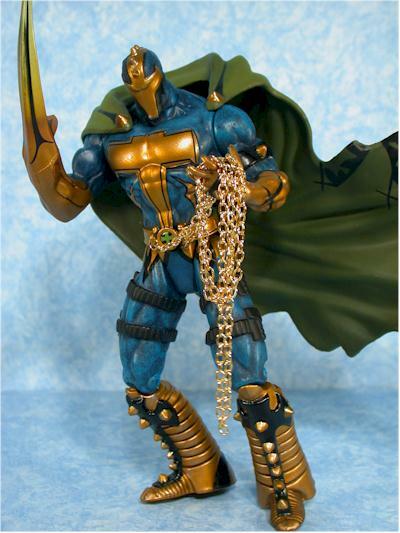 Redeemer is adequate as a repaint, with some unique color choices. I like the light blue of the body, and the gold is eye catching and sharp. Domina's colors are the least attractive, at least for me. I prefer the original color scheme, but at least the paint work is clean. None of these figures do particularly well when it comes to articulation. That's not due to a lack of joints, but a lack of useful joints. WOD has neck, shoulders, right cut bicep, cut forearms, hips, and cut calves. It sounds like a lot, but most of the joints only allow for the most basic of movement and positioning. He does stand just fine on his own though. Redeemer has neck, shoulders, left elbow, hips and knees. Again, most of the joints (like the elbow and knees) have an extremely limited range of movement. Domina has the most articulation, and gets the worst score. She has neck (very limited due to the hair), right shoulder, right bicep, right wrists (nothing on the left arm!) chest, cut thigh, and cut calves. Even with the leg joints, she has an extremely tough time standing, and you have to get her in just the right pose. The only really useful articulation is in the right arm, where you can do a little posing with the sword. WOD and Redeemer come with zippo, unless you count the real metal chain with Redeemer. Of course, it's not removable so it doesn't count as an accessory in my book. So how did Redeemer get three stars? I'm counting his light up feature here, since he's the only one with a special feature like that. It works pretty well too, but the separation between the chest and the emblem shows up a little too much when you light up the arm. The redesigned the box in back to be smaller, which is certainly a welcome change. Domina has three accessories - a very cool sword, knife and shield for her arm. The shield snaps on nicely, and the knife fits on her belt. 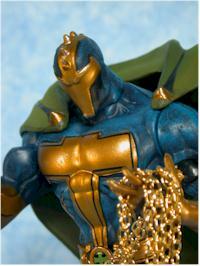 The sculpts are good, and they are decent accessories. Considering that these are just repaints, $10-$13 is really way too much. Even WOD, who at least gets some re-sculpt work, is stretching the value factor. This series is pretty much thrown in to make a few more bucks off old molds. I'm not a big fan of repaints in general, but if you missed any of these the first time around they may be worth it to you. 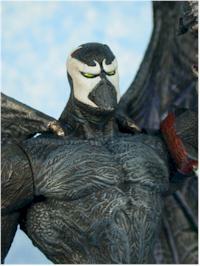 The Wings of Redemption Spawn is the nicest of the lot, and will look good on the shelf next to the original. His score would be better if you weren't paying such a steep price. - Beans Toys has a great price for the set at $54. Since there are six figures in the entire set, that's less than ten bucks each. They also have a couple of the figures available as singles. Look under their McFarlane Toys section.